Alexander Payne always does a fantastic job of tapping into unusual characters in unusual situations, but always using it to provide the audience with some insight into themselves. Election, Sideways, and About Schmidt (I’m ignoring his odd moneygrab to write Jurassic Park III), all have extremely flawed, and very human characters. 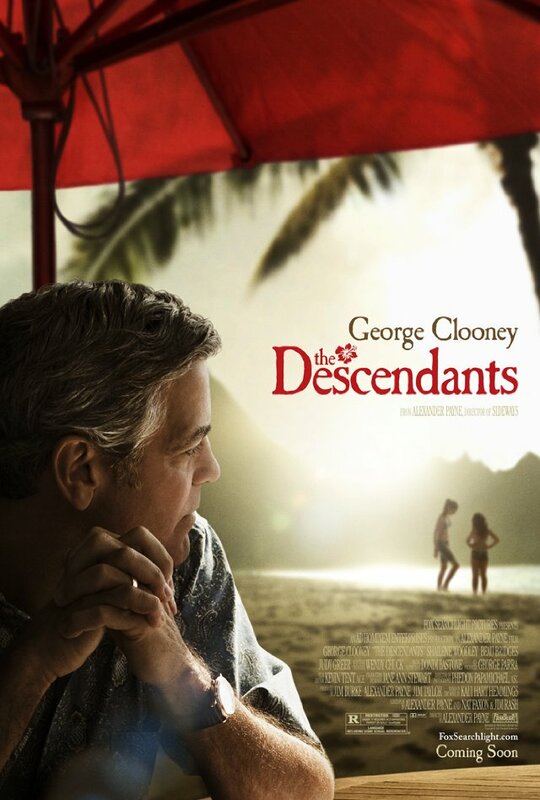 In The Descendants, Payne immediately puts George Clooney’s Matt King in a perfect confluence of quandaries: He is in charge of an estate on Kauai that his family has owned for generations, of which his whole family wants to sell to developers. But, he is the trustee. His youngest, firecracker of a daughter is being malicious to other kids at school. His older daughter was sent to a private school on other island because of conflicts with her mother, Clooney’s wife. His wife as been in a boating accident and is in a coma. He’s been told by the hospital that she won’t recover. And to top it off, she was having an affair. In someone else’s hands, this would make a whole season of Days of Our Lives, and have about as much depth. But this is Alexander Payne. He brings us into this very tragic situation, and allows us to ride this journey with Clooney, and root for him. Hope that he’ll make the right decisions. Be with him as he attempts to get closer with his kids despite the loss of their mother. And to be able to find humor in even the darkest of situations. Perhaps that is why I was drawn to this movie. I do try and find humor is nearly everything – even if it might offend others that I do. The performances are outstanding all around including an inspired bit of casting of Scooby-Doo’s Matthew Lillard. Shailene Woodley (Alexandra) and Amara Miller (Scottie) are great as the feisty daughters. Nick Krause plays Alexandra’s stoner friend with amazing reservation that makes Franco’s Pineapple Express role look like a Keystone Kop. You can feel Robert Forrestor’s pain of losing his daughter underneath the gruff and abrasive exterior of King’s father-in-law. But this is Clooney’s show, and rightly so. He throws away the typical Clooney charm, and allows King to be the hurt and flawed character that he is. Always attempting to do the right thing, but wrestling with what the right thing is. The screenplay would have been good, or better than good, probably outstanding, regardless of the cast. But it’s to their credit (and Payne’s direction) that they take this to the level that puts it above most of the releases this year.